There is a different kind of excitement about Change Day Australia in the count-down to 11 March 2015 than in the lead-up to the 2014 event. Last year I felt a nervous anticipation – 2014 was the inaugural Change Day in Australia to which a smallish band of passionate people, including me, had dedicated a lot of time and effort. We have a pretty good health system in Australia in lots of ways but it absolutely can be better. Would people come on board? Change Day is all about doing something better together – the FAQ is a good overview if you crave more information. 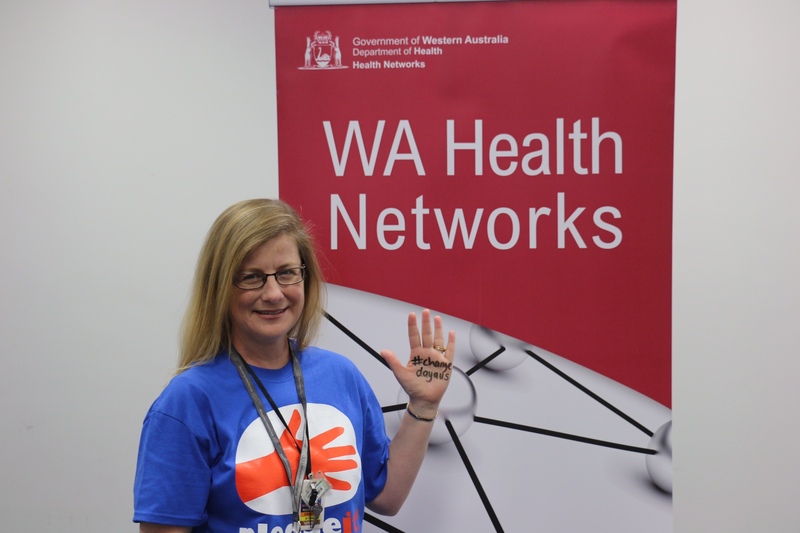 big ticket items such as the Western Australian Director of Public Health pledging to develop a memorandum of understanding with the WA Health Consumers’ Council. For Change Day 2014, I pledged to do my best to raise awareness of, and encourage participation of people in Western Australia in Change Day, and am thrilled that WA did achieve roughly 3500 pledges, approximately a quarter of the total in 2014. Many more people within WA have now heard of Change Day and lots of taken up promoting the 2015 campaign themselves with enthusiasm we could only have dreamed of last year. 2015 is shaping up to be even better, approaching 20 000 pledges from across Australia before the big day. Again the breadth of pledges is amazing. Check out the 2015 Pledge Gallery. The effort for 2015 has been more about embedding than beginning. The excitement now is palpably more confident that this is an initiative which people will increasingly embrace and with a greater impact. What do I find most exciting about Change Day? People are recognising and embracing the NEED to change. People are empowered to identify and make change(s) themselves, rather than just be subject to changes made around them. Change Day prompts every one of us, whether working in health or not, to think about what we could each do to improve health. Improving the health of our community is everyone’s responsibility. The benefit of teams uniting to pledge together has also been highlighted by many. How great are the fabulously creative ideas that people have come up with? Some even involve creativity in health (see my posts on Where health and creativity intersect and The healing power of creativity if you want to understand why this excites me). The enormous cumulative potential of many people each pledging to do even just one thing – collectively we can make a huge difference. The power of Change Day is in the simplicity. Just think what can be achieved if we repeat and grow Change Day Australia every year! Personally I have found it extraordinarily rewarding to help drive something that has so much potential, to meet so many people passionate about creating opportunities for positive change in health and to learn from the creative approaches taken by others. This year I have pledged to work with my colleagues and networks to help people with (or at significant risk of) cardiovascular and other chronic health conditions to improve the quality of their lives through better access to information, support and more options for care outside hospitals, especially towards the end of life. It’s no small ask but for me this allows me to draw across the different positions I hold, the networks of which I am a part to do something valuable and my passion for writing. There is some scope to achieve this in different ways. Flexibility is good as how things can be best done may be not fully appreciated even knowing what the starting steps are. Once you decide what you need to do, opportunities appear. As soon as I pledged I felt enormous relief – I could now get on with doing rather than thinking about what to do or how to word it! Over to you – I urge you to pledge now! Big or small, easy or difficult, creative or picking up on someone else’s idea, under anonymity or with your name … Whatever works as long as it will in some way improve health. Go on, you know it’s the right thing to do. Have you thought about a pledge for Change Day? If you’ve pledged – either this year or before – what have you achieved so far? Thanks Louise! As a GP initially (and still but with added roles) it’s fabulous to be part of an initiative that is so far reaching. It’s great to hear how the movement is growing! And it reminds me of something Alice Walker said, “The most common way people give up their power is by thinking they don’t have any.” Change Day will empower people just by the nature of them making the pledge! What a fabulous quote Laura and one from a most inspiring woman and writer. It lends itself brilliantly to Change Day. I am excited to see is growing Internationally also, having had its roots in the UK. Thanks so much for bringing your wisdom to the comments!